Had we had ten Hilaire Bellocs in the English-speaking Catholic world in the past fifty years, we might have converted the whole kit-and-caboodle and avoided the mess we find ourselves in today. Hilaire Belloc, coupled in memory always with his great friend G. K. Chesterton, made the defence of the Faith the main business of his life. He wielded a mighty sword. Hilaire Belloc was not built to fit any cloth fashioned by mortal man. Although he often groused about his own age (I do not mean his chronological age — he always complained about that! — but his moment in time), Belloc would have been impossible in any other age. Growing up as he did, in the twilight of the reign of Queen Victoria, blinking brilliantly in nonsense verse and radical politics in the time of King Edward VII, a child prodigy called by his aunt “Old Thunder”, Hilaire Belloc reposed upon a broad upper-middle-class English society that read him, first adored him, then good-naturedly put up with him, and finally isolated him. “I was once welcome in that house”, he commented wistfully when the automobile in which he was driving passed the home of an exceedingly rich man. His intransigent defense of all things Catholic first amused a literate and basically skeptical gentry looking for novelty; then offended; finally, it was considered intolerable. A. N. Wilson in his biography of Belloc wrote: “If I created a character in a novel as Hilaire Belloc, people would not believe it.” Belloc was a paradox: a lyrical poet who never read any contemporary poetry; a rhymester whose high finks still charm children; an artilleryman on bivouac at Toul who smelled the Revolution as “France went by”; an aging monarchist who savored the last charge of Charles I at Naseby; the most versatile and certainly the finest English prose stylist in this and possibly any century, who grumbled from the liberty of his battered old boat, the Nona, “dear reader, read less and sail more” even as he lusted for bigger and better-paying audiences; the perpetual wanderer tramping Europe, burning for adventures even as he sang the praises of a rooted peasantry and a hearth steeped in seasonable traditions that “halted the cruelty of time”; the enemy of the rich and of capitalist greed, who once asked for a bucket of money as a birthday gift; the passionate advocate of Truth, who once groused, however, “that the truth always limps”; the drummer boy of an English-speaking Catholicism he helped make proud of itself. At my last count, Hilaire Belloc wrote 153 books. The business has to do with vigor, an enormous lust for life, and a willingness to make mistakes. Belloc did not give a damn for what anybody thought of him. He wrote his life of King James II in a hotel on the edge of the Sahara in ten days: “It is full of howlers and is the fruit of liberty.” He walked to Rome as a young man, coming in upon the Appian Way on a mule drawn cart — but with his feet dragging on the road so his vow would not be broken. Every pleasure I know comes from an intimate union between my body and my very human mind, which last receives, confirms, revives, and can summon up again what my body has experienced. Of pleasures, however, in which my senses have no part, I know nothing. An almost savage realism mixed with Belloc’s sensibility, and his meditations on death are the most moving in all English letters. Read of the execution of Danton, written in the fires of early youth; of the murder of King Charles I; of the deathbed conversion of King Charles II; and, finally, in his Elizabethan Commentary, one of his last books, Belloc reveals himself: “She felt that she was ceasing to be herself and that is what probably most of us will feel when the moment comes to reply to the summons of Azrael.” Belloc’s emotional skepticism is at its purest in an essay called “Cornetto of the Tarquins” in his Towns of Destiny. Speaking of those tombs which are of the origins of us all, he tells us of “the subterranean vision of death, the dusk of religion, which they imposed on Rome and from which we all inherit — then as I thought to myself, as I looked westward from the wall, how man might say of the life of all our race as of the life of one, that we know not whence it came, nor whither it goes”. Confessing himself to be of a skeptical mind, in a famous letter to Chesterton on the occasion of Chesterton’s conversion, Belloc’s skepticism was conquered by his faith, but the temptation to despair remained with him all his life. To me, this has always seemed strange because Heideggerian angst and dread before the specter of the Nothing seem the peculiar and often awful temptations of those with a metaphysical bent of mind — and Belloc had none at all. In The Cruise of the Nona, he wrote “of the metaphysic . . . who can see it and who can bite into it? It is of no use whatsoever.” Altogether without philosophical preoccupations, he was nonetheless haunted by the temptation that at bottom there is no answer to the riddle of human existence. His conquest of that aberration made his faith something hard, crystal clear, without compromise. Of religions other than the Catholic he had an Olympian contempt and an impatience only barely disguised and then imperfectly. He would not have fared well in these days of ecumenical tea parties, and the so‑called New Church would have bewildered him. Belloc frequently took pains to point out that tolerance is always of a lesser evil that cannot be vanquished at the moment, but vanquished it ought to be. 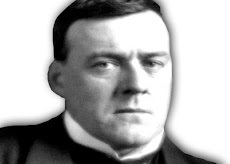 From whence, then, came his lyrical Catholicism, for which he was to sacrifice fame, all possibility of wealth — Belloc died a poor man — and every avenue — there were many of them — for a public career in politics? Born and baptized in the Church, a Catholic from childhood, his love and appreciation of the Faith came to him when young, but it came somewhat slowly. Of his inner life he tells us very little. French on his father’s side, Belloc — it must be remembered — did his military service in the French artillery, thus delaying his entrance into Oxford when he finally made up his mind to remain an Englishman. His spoken French remained that of a rough cannoneer. Latin European culture was the air he breathed in his youth and to which he returned whenever he could, even sailing across the channel to replenish his reserves of wine. Were I to seek one scriptural passage which sums up Belloc’s vision of the Faith, it would be: “By their fruits ye shall know them” (Mt 6:30). Aided here by a powerful visual imagination which was brought to bear in his many military histories, Belloc could see the Church at work down the ages — and he adored what he saw. The Church made Europe and in so doing quickened the old Roman Order, in disrepair but by no means destroyed by the Germanic tribes from the north. All our typical Western institutions were either created by Catholic men from out of nothing or were inherited from our pagan forefathers and then quickened from within by the yeast of Christianity. Although the terms incarnational and eschatological were not current in Belloc’s lifetime, he is a prime instance of a man with an incarnational understanding of religious truth. Belloc looked for blessings everywhere, and the whole of Christendom was for him an immense network of actual graces. Making his own the Thomistic insistence that grace perfects nature, the inheritance of classical antiquity, he maintained, was preserved and transfigured in the fires of Faith. In our world — at least as Belloc knew it in what might have been its twilight: the subject is foreign to my paper today — men achieved a free peasantry that marked the whole of Europe for centuries. 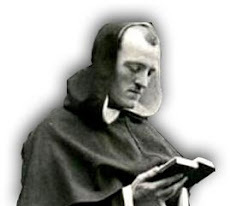 In that ordo orbis, justice flourished and free men discovering thus their liberty exercised it through two millennia in the creation of a culture that Belloc once called “the standing grace of this world”. There we all experienced not only a free citizenry but the sacredness of marriage, the dignity of men, chivalry, the steady rejection of Manichean irresponsibility and of every pantheist negation, the sacramental universe. These are to be found in Catholic Europe and wherever else she has stamped her genius, and are to be found as corporate doctrines tending to actuality nowhere else on this earth. Hilaire Belloc, spreading his many talents and his incredible energy through the essay, a respectable body of very good verse, military history, nonsense novels, biography and books of travel, studies on the road, political polemics, economic theory, concentrated it all into a center, into a synthesized focus: the apostolate of history. Credo in unam, sanctam, apostolicam eccelesiam, we all recite — but Belloc took the note of apostolicity seriously. I do not mean this in the sense that Belloc showed a lively interest in controversy concerning the apostolic succession. He took that as a settled issue: Roma locuta est, causa finita. I mean it rather in the sense that he understood himself to be a man called to be an apostle. Ronald Knox, in his panegyric at Belloc’s grave site, called him more a prophet than an apostle. Possibly both Knox and I are right because Hilaire Belloc was a missionary in Protestant England, and his principal weapon was history. I doubt that this was a conscious decision, a free act exercised at one crucial moment in his life. By temperament and talent, Belloc was an historian. He soon concluded, shortly after his disillusion with parliamentary politics (he served two terms, one as a Liberal and one as an Independent), that the English‑speaking world had been lied to about its past and about its present, that this lie was bound up with the Protestant establishment, which officially dates from 1689 but which in fact reached far deeper into the English past. Agreeing with Cobbett (whom, however, he rarely cited and who apparently had little direct influence on him: the two men converged in their historical judgment) that the Protestant Reformation “was the rising of the rich against the poor”, Belloc unpacked layer after layer of “official history” and turned over its foundation, a Great Lie. The religious zealotry of a handful of heretics was used by the mercantile and landed classes of England, aided by the lust of Henry VIII, to abolish the old Catholic Order. If Belloc had any real enemy, it was the Whigs. Of the Earl of Shaftsbury, he wrote: “He is probably in hell.” William of Orange he called that “little pervert”and, of course, the man was just that! Although Belloc never quoted Samuel Johnson’s famous “The Devil was the first Whig”, the whole weight of Belloc’s historical writing yields the same conclusion. But although Belloc loathed the Whigs, he had little in common with the Tories. A populist Catholic radical, a burned‑out republican by middle age, a man chastened into royalism, he would have been out with Bonnie Prince Charlie in the ‘45. Time prohibits my detailing Belloc’s revolution in English historical writing. Suffice it to say — and this is said formally and altogether without rhetorical emphasis — that one man, Hilaire Belloc, turned the whole writing of British history around. Since Belloc, nobody can get away with understanding the Reformation as the work of high‑minded souls bent on liberty and democracy, noble souls who brought England out of the darkness of Catholic superstition and medieval obscurantism. Others footnoted Belloc and traded on his vision. They did well in doing so, but the vision was his — as was the persecution of silence that followed on his work. If by their fruits ye shall know them, then the fruits of the Revolt against Rome have been sufficiently documented; more important, they have so pained the bones of all of us that to know them well is to revolt against the Revolt. Men were cheapened in their dignity. They cringed Calvinistically under a cruel and implacable God who damned most of them from all eternity to hell, and who filled the barns of the saved. The beauty and grandeur, even languor, of an old order of things gave way to a severity and grimness of style and manner that choked off man’s natural response to the beauty of the world God had created. Belloc would have none of it, and he exposed the fraud. Behind the psalm‑singing fanatics, there reposes the weight of what he called The Money Power, the new Capitalism and Banking System, that enslaved Europe to its greed. Belloc detailed it all in lavish description in book after book — toward the end, he was repeating himself. If his prose never bored, his arguments often did. The modern world, built on money and heresy, has had and has as its enemy the Catholic Church and the Order she has created. Quite clearly, Mr. Belloc, as he was called in his old age, did not like the modern world — gray, anonymous, bereft of beauty, craftmanship ignorant of nobility, shorn of dignity. Yet, as already noted, the England of his own time was probably the only place he could have flourished as he did. Winston Churchill offered him a high honor, in the name of the king, in the twilight of Belloc’s life, when the bombs were bursting over Britain. Belloc turned him down courteously. Cardinal Ratzinger wrote, in a piece about liturgy a short time ago, that the only apologetic the Church has for her truth are her saints and her art. Neither are to be found anywhere else within the broad sweep of man’s adventure through time as they are in the Church. Belloc, I think, would have agreed in part with the cardinal. How often did our author pause before tower and church, the easy grace of French and English villages unspoiled by industrialism, as they broke upon vision at dawn and then heightened and blessed the woods and hills surrounding them? How often did he not speak of the Cathedral of Seville as the first marvel of Western art — and this from a man French and not Spanish in temperament? And did he not write the finest panegyric to Saint Joan of Arc — none is better — and do it in an English that matched the French of her own time? No: if the Faith be not the answer to the human heart, then there is none. But Belloc would probably have added to Ratzinger’s saints and art the entire social order brought into being by men who sensed, often obscurely, that if Christ’ were not in the marketplace, he was nowhere. And this, I hasten to add, from a man who held that the center of existence was the tabernacle of the altar. Those close to him have witnessed to his deepening devotion to the Eucharist as the years bent him down. Indeed, Belloc insisted, it was the hatred for and attack on transubstantiation that formed the center of the bitterness moving the English reformers in the sixteenth century. Read Belloc on Cranmer. They turned all the altars around and made of them tables and thus first obscured and finally denied what it is that gave life to Catholic churches and left all others temples reminiscent of tombs. Faith is to be fought for and, once won — if won only precariously — cherished and watered, but not watered down. So too with the civilization crafted into being for us by the Faith: it must be loved and defended. We might all read Belloc’s meditation “Wall of the City”: within, the busy commerce of decent men who go about the pots and pans of life and who worship God as he is carried through the streets in the monstrance — and without, the enemy! Belloc articulated that enemy for his own time. The enemy is the barbarian, but he always used the word analogically; and the older barbarian before the walls comes off better than his modern counterpart for Belloc. “The Barbarian” within is the man who laughs at the fixed convictions of our inheritance. He is the man with a perpetual sneer on his lips. He is above it all: he judges the poor believer in the street or in the church, some old woman huddled before a shrine of the Virgin mumbling her beads, and he judges her harshly. It is hard enough to come by belief and to live in it, but to throw it away for a cheap joke is despicable. Such are the Barbarians. The Barbarian hopes — and that is the mark of him, that he can have his cake and eat it too. He will consume what civilization has slowly produced after generations of selection and effort, but he will not be at pains to replace such goods, nor indeed has he a comprehension of the virtue that has brought them into being. Discipline seems to him irrational, on which account he is ever marvelling that civilization, should have offended him with priests and soldiers .... In a word, the Barbarian is discoverable everywhere in this, that he cannot make: that he can befog and destroy but that he cannot sustain; and of every Barbarian in the decline or peril of every civilization exactly that has been true. Belloc is describing just about everyone you met at your last cocktail party or faculty meeting. Barbarians are everywhere. We sit by and watch the Barbarian, we tolerate him; in the long stretches of peace we are not afraid. We are tickled by his irreverence, his comic inversion of our old certitudes and our fixed creeds refreshes us; we laugh. But as we laugh we are watched by large and awful faces from beyond: and on these faces there is no smile. Of these men he added — and this too from the desert — “Their Faiths turn to legend, and at last they enter that shrine whose God has departed and whose Idol is quite blind.” When our Lord vanishes from the household shrines of the West, the drums are muted and men worship abstractions — as they do today — new idols. But behind them there is an awful power, and it is not of this world. Possessed of a highly poetic and prophetic mind, Belloc possessed as well a sharply honed intelligence. His The Servile State is a prolonged syllogism with not a metaphor in the whole book. His general thesis, argued in 1909, that the West was moving toward neither pure socialism nor pure capitalism is today a commonplace. It happened. We can either mourn or delight in our consumerist society. I get the impression that Belloc did a little of both. Be that as it may, his “distributist society” lies outside the scope of this paper. His Survivals and New Arrivals is closer to my subject. Islam, he predicted, will return because Islam is a permanent menace to the Faith. Islam has returned. Bible Christianity or Bibliolatry could return but probably will not: Belloc was wrong. Fundamentalism is with us everywhere today in the United States: vulgar, as Belloc said it always was, primitive in thought, as Belloc pointed out; sophisticated in its use of an electronic technology which he could not have predicted. Arianism, the modern name of which is modernism, has come back with a vengeance in the Church. Belloc sketched that possibility as well. All of his predictions in this interesting book were closely reasoned, but such argumentation, he admitted it, is often mocked by the mystery of the future. His reasoning prowess truly came into its own in several controversies: one with Coupon on medieval Catholicism, where Coupon got the facts right but turned the picture upside down; one with H. G. Wells on the origin of man, where Belloc complained privately that the Church hampered him because it has swallowed “all that Hebrew folklore”; and, finally, one with Dean Inge, where Belloc nails his enemy to the wall. There wholly escapes you the character of the Catholic Church .... You are like one examining the windows of Chartres from within by candle‑light but we have the sun shining through . . . . For what is the Catholic Church? It is that which replies, co‑ordinates, establishes. It is that within which is right order; outside the puerilities and the despairs. It is the possession of perspective in the survey of the world .... Here alone is promise, and here alone is foundation. Those of us who boast so stable an endowment make no claim thereby to personal peace; we are not saved thereby alone .... But we are of so glorious a company that we receive support, and have communion. The Mother of God is also our own. Our dead are with us. Even in these our earthly miseries we always hear the distant something of an eternal music, and smell a native air. There is a standard set for us whereto our whole selves respond, which is that of an inherited and endless life, quite full, in our own country. You may say, “all that is rhetoric.” You would be wrong, for it is rather vision, recognition, and testimony. But take it for rhetoric. Have you any such? Be it but rhetoric, whence does that stream flow? Or what reserve is that which can fill even such a man as myself with fire? Can your opinion (or doubt or gymnastics) do the same? I think not! One thing in this world is different from all others. It has a personality and a force. It is recognized and (when recognized) most violently hated or loved. It is the Catholic Church. Within that household the human spirit has roof and hearth. Outside it is the night. He once wrote that the French are blessed by the capacity to criticize themselves and to surmount their own criticism. 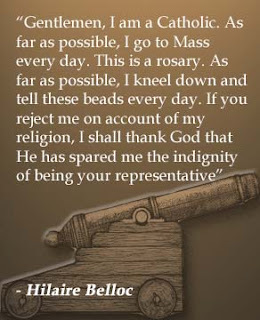 Be that as it may, Hilaire Belloc rarely criticized the Church. He loved her altogether too much. He never answered personal attacks by fellow Catholics. It would have been, he said, a sin against his own body. Times change, and today a Catholic writer can make a good living attacking his own Mother. 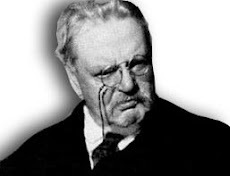 But Hilaire Belloc, coupled in memory always with his great friend G. K. Chesterton, made the defence of the Faith the main business of his life. He wielded a mighty sword. “Gigantes autem erant in terram in diebus illis.” “There were giants upon the earth in those days” (Gen 6:4). But the sword of Hilaire Belloc was buried with him. I gravely doubt whether we shall see his like again. Wilhelmsen, Frederick D. “Hilaire Belloc: Defender of the Faith.” In The Catholic Writer: The Proceedings of the Wethersfield Institute 2 (1989): 83-95. The late Dr. Frederick D. Wilhelmsen was professor of philosophy and politics at the University of Dallas, Irving, Texas. He wrote over 250 articles and fourteen books, among them Christianity and Political Philosophy, Citizen of Rome, and Being and Knowing. Just before his death in early 1996, he was at work on a collection of adventures and reflections of life and sailing the high seas entitled, Under Full Sail: Reflections and Tales.